The gourmet meal must meet very strict requirements : it starts with an apéritif (welcome drink) and ends with a digestif (digestive drink). There are at least four dishes between those drinks : one appetizer, one fish and/or meat entrée with veggies, some cheese and dessert. The gourmet meal is part of the French identity. The confectioner’s cap is made from white calico with (almost) no rim. In France, it is large, vertical and pleated. It was invented in 1821 by Marie-Antoine Carême. 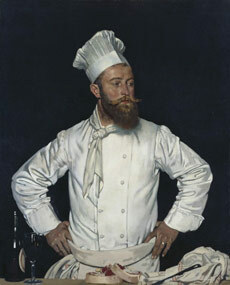 A symbol of the profession, it points out a reward and distinction given to a chef by his peers. The silver cap is handed over during the prize ceremony of the National Academy of Cooking. 1270: Régnaut-Barbon registers the status of the « oublieurs », makers of « oublies » and light pastries : the « oublieurs » are the ancestors of confectioners. 1348: creation of the cake from Savoie by Pierre d’Yenne, master cook of the Duke of Savoie Amédée II. 1440: the « licorn » becomes the symbol of the oublieurs. 1485: a new status for the confectioners is published mentioning off days such as Saint Michael day in honor of the protector of all confectioners. 1566: the « oublieurs » become « confectioners ». The apprenticeship lasts 5 years and they have exclusivity for the production of meat, fish and cheese loafs. 1630: Claude Gelée a French painter, may be the inventor of the foliated pastry. 1638: creation of the amandines by Ragueneau. 1660: Vatel, cook of the Prince of Condé invents crème Chantilly (whipped cream). 1686: opening of Le Procope,the first café in Paris. Tea, coffee, chocolate and ice creams are served. 1740: Stanislas Leczinski invents the Baba au Rhum (starting from the kugelhopf). 1760: the confectioner Avice creates the grilled puff pastries and ramekins. 1778: foundation by Mr. Miche of a nougat factory in Montélimar. 1784: Anthonin Carême, cook of Talleyrand is a big promoter of modern confectionery. He authors the « royal confectioner ». 1793: creation of the macaroon from Nancy by the ladies of the Holy Sacrament. 1800: creation of the Genoa bread. 1803: creation of the pelletizing. 1805: the cornet decoration, an idea of Lorsa a confectioner from Bordeaux. 1808: today’s brioche is made by the Maison Félix in Paris. 1820: invention of the piping bag (replacing the large cornet). 1825: création of the St.Génix brioche. 1826: publication of the book by Brillat-Savarin: « Physiology of taste ». 1830: invention of the ice-cream machine by Nancy Johnson. 1840: Chiboust, a confectioner from rue St. Honoré creates the « St.Honoré ». 1846/1935: Auguste Escoffier, a famous cook, authors several books. 1848: the Julien brothers create « le Savarin » and « le Trois Frères ». 1850: Siraudin a confectioner from Paris invents the ganache (chocolate-based filling). 1856: the Frascatti confectioners invent « la religieuse ». 1869: Sergent, a confectioner from Paris becomes the millefeuille (Yarrow) specialist. The compression refrigerating machine and the margarine are invented. 1870: the rules of pasteurization are defined (Louis Pasteur). 1872/1965: Curnonsky is nicknamed the « prince of gourmets ». 1879: Charabot creates the first Christmas bûche (log). 1882: creation of the candied chestnuts by Clément Faugier. 1890: creation of the bourdaloue pie (an apple and pear pie) by Lesserteur. 1900: creation of the « Peach Melba » by Auguste Escoffier. 1905: creation of the « puits d’amour » (the love well) by Paul Coquelin. 1919: creation of the technical education and professional courses for confectionery apprentices. 1924: first ice cream factory in France. 1930: Boissier, Bourbonneux, Coquelin, Latinville, Ragueneau and Rey are among the most famous confectioners in Paris.